We would like to thank the 230 donors who helped us raise $261,621.00 for the Under the Lights and John Picone Memorial project. 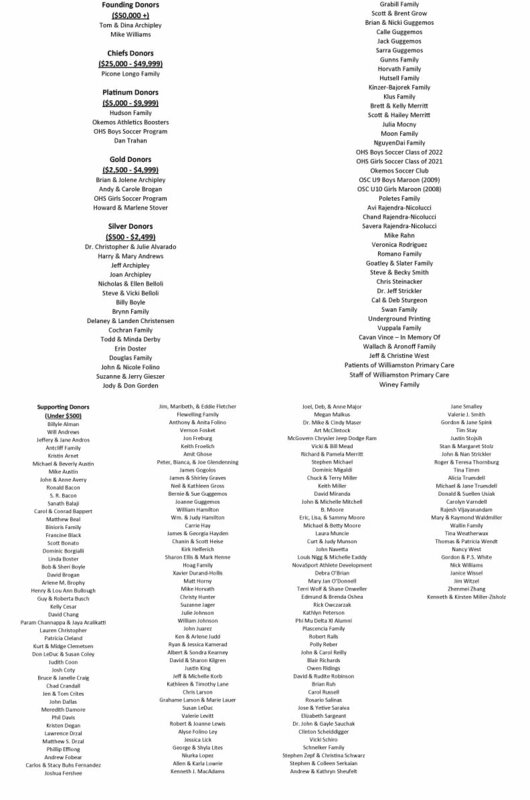 We truly appreciate the generosity of all those listed below who donated. THANK YOU! The family of late Okemos varsity soccer coach John Picone have made a heartwarming gesture in appreciation of the outpouring of support for the Okemos Lights Project and Picone memorial and stadium renaming. They've announced they will match all donations up to $30,000 in the month of February. All former, future and current soccer families are encouraged to donate in February to maximize the matching funds offered by the Picone family. Viva Maroon! Donations are being sought for an ambitious project to upgrade the Okemos Varsity Soccer Field. With a mission of creating a premier high school soccer facility to continue the legacy of Okemos soccer, the Under the Lights Soccer Project, will have two phases. The first phase will be to install lighting and create a memorial to, and rename the stadium for, legendary soccer coach, John Picone. The second phase will be to install security fencing around the practice facility, relocate and upgrade the scoreboard and landscaping. The goal is to have both phases done by fall of 2018. The project is long overdue according to varsity soccer coach Brian Guggemos. "Not many people realize that we're one of a handful of schools in the area without lights. East Lansing, Dewitt, Mason, Williamston, Grand Ledge, Holt, Lansing Catholic, Fowlerville, Charlotte and Eaton Rapids all have lights," Guggemos said. Although lights create a great atmosphere for games, there are practical reasons to add them. They include generating revenue with the ability to host CAAC Cup finals, district, regional, semi-final and state final matches and improved start times for families. "Right now, we have to start our JV matches at 4pm and our varsity at 5:30pm. That makes it tough for parents and community members to see games. "By adding lights, our JV games could start at 5 or 5:30pm and varsity at 6:30 or 7pm," Guggemos added. As of Janurary 1, 2018, $170,000 of the estimated project budget of $230,000 has been raised. The rest of the money will need to come from local businesses, former players and the Okemos soccer community. The goal is to have all the money raised by February 15th in order to start work this summer. If you are interested in finding out more and supporting the future of Okemos soccer, click on the donation and sponsor form below. If you'd prefer to make your tax deductible donation by check, make it to Okemos Athletic Boosters (put Soccer Lights Fund in memo) and mail it to PO Box 57, Okemos, MI 48805.